By nature, running backs are more valuable in standard leagues than they are in PPR leagues. But as we know, some running backs are significantly more valuable with PPR scoring, while others see a big reduction in fantasy output. This article is straightforward, so we’ll cut to the chase – which running backs gain the most fantasy value in PPR leagues, and which running backs lose the most value? We knew McCaffrey was going to be a threat through the air, but as a rookie last year, he actually led all running backs in targets (106). He ranked in the top five at the position in receptions (80), yards (651) and receiving touchdowns (5). Overall, McCaffrey scored 0.41 fantasy points per opportunity (PPO) in PPR leagues (44th among RBs) versus just 0.26 in standard leagues (66th). My early auction values have McCaffrey worth 52 percent more in PPR leagues compared to standard leagues. 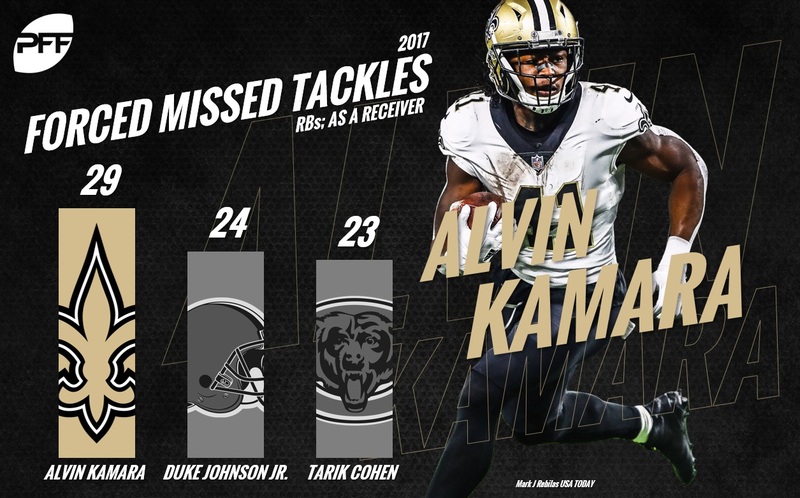 Kamara rocked the fantasy scene last year as both a rusher and receiver – but it can’t be understated just how good he was as a receiver. His 826 receiving yards paced the position, and his 81 receptions trailed only Le’Veon Bell. Obviously, Kamara is valuable in both standard and PPR leagues, after all, he led running backs in points per snap (PPS) in both scoring formats last year. But he doesn’t have a ton of intrinsic value as a rusher, as he carried the ball just 120 times last year. Adrian Peterson – and 35 other running backs – had more rushing attempts. My early auction values have Kamara worth eight percent more in PPR leagues compared to standard leagues. White was the No. 36 running back in PPR leagues last year – making him a viable flex option, but he was the No. 47 option in standard leagues, which meant he was more of a benchwarmer in that format. White had just 43 rushing attempts last year with no rushing touchdowns (excluding the playoffs). His 43 rushing attempts ranked 68th among running backs, but his 68 targets ranked ninth at the position. My early auction values have White worth 60 percent more in PPR leagues compared to standard leagues. Riddick tied White with 68 targets, ninth among running backs. His 0.44 fantasy PPO in PPR leagues ranked 29th among running backs last year, while his 0.29 PPO in standard formats ranked 48th. Riddick has never had much value as a rusher, he has gained fewer than 4.0 YPC in all five of his years, and the Lions added Kerryon Johnson to the squad, which should further solidify Riddick as a third-down back. Riddick is a strong receiver, though. He has ranked in the top six among running backs in terms of yards per route run (YPRR) each of the past three seasons, including a first-place finish in 2015. My early auction values have Riddick worth 43 percent more in PPR leagues compared to standard leagues. Few people seem to realize how valuable Johnson was in PPR leagues last year. In fact, he was the No. 11 running back – ahead of guys like Jordan Howard, Devonta Freeman, Dion Lewis and Lamar Miller. Johnson was good in standard leagues too, but he was more of a tail-end RB2 rather than a tail-end RB1 (he finished 19th overall in standard leagues). His 90 targets, 74 receptions and 693 receiving yards all ranked in the top five at the position last year. My early auction values have Johnson worth 27 percent more in PPR leagues compared to standard leagues. 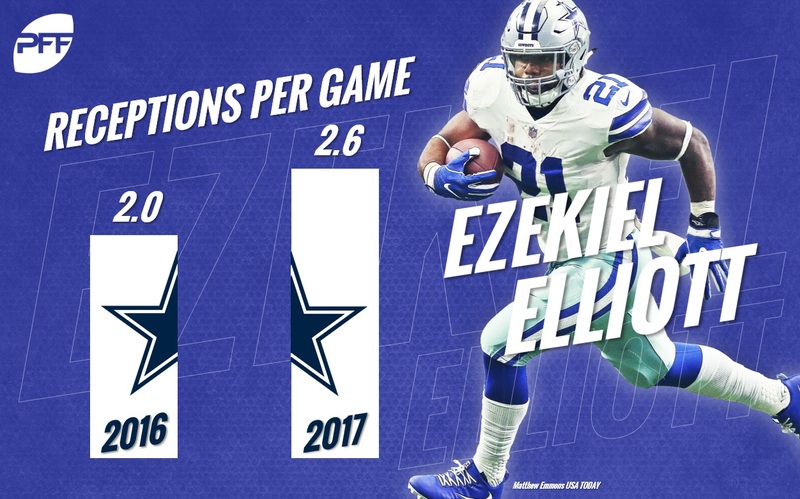 Elliott was non-existent as a pass-catcher as a rookie in 2016, as he averaged just two receptions per game. He found some footing as a receiving threat last year and saw his per-game reception average rise to 2.6. It wasn’t enough to fully close the gap, though, and Elliott was still much more efficient in standard leagues. His PPO in PPR leagues ranked 47th among running backs last year, while his PPO in standard leagues ranked 29th. My early auction values have Elliott worth 21 percent less in PPR leagues compared to standard leagues. Fournette’s rookie season wasn’t as bad as Elliott’s from a pass-catching perspective, but it still left plenty to be desired. Fournette caught 36 passes in 13 games (2.8 per game), but he wasn’t able to establish himself as a true dual-threat for Jacksonville. The Jaguars gave Fournette 43 targets – most among their running backs – but Yeldon wasn’t too far behind (35 targets), and Chris Ivory had 25 targets to his name as well. My early auction values have Fournette worth 22 percent less in PPR leagues compared to standard leagues. Howard has been the subject of scrutiny in the fantasy community in recent months due to his lack of receiving chops. He caught just 23 passes last year, which is a remarkably low number for a featured back. Tarik Cohen more than doubled Howard’s receiving production (53 receptions) and nearly tripled his amount of receiving yardage. Even Benny Cunningham was utilized via the air more than Howard on a per-game basis (20 receptions in just nine games). Howard ranked 11th in terms of fantasy PPS in standard leagues and 18th in PPR leagues. My early auction values have Howard worth 24 percent less in PPR leagues compared to standard leagues. Blount could be the poster-child for studies like this. Blount has 54 receptions in his entire career, which began back in 2010. A total of 10 running backs had more than 54 receptions last year alone. Throw in the fact that he’s now in the crowded backfield that is the Detroit Lions’ RB room, and it wouldn’t be a surprise to see Blount record fewer than five receptions this year. My early auction values have Blount worth 59 percent less in PPR leagues compared to standard leagues. Henry will no longer have DeMarco Murray to contend with, which will free things up for him on the ground, but the Titans added Dion Lewis during free agency, which means Henry will continue to do most of his damage as a runner. It makes sense that the Titans added a pass-savvy back to pair with Henry as he caught just 11 passes last year despite playing in all 16 games. My early auction values have Henry worth 56 percent less in PPR leagues compared to standard leagues.